A wedding is always a happy time for families to celebrate. In the Muslim world, there are colorful, cultural variations from place to place. Two male witnesses who are the members of family in most cases, are required for Nikah. According to the Quran, a married Muslim couple, both husband and wife act as each other’s protector and comforter and therefore only meant "for each other". All Muslim marriages have to be declared publicly and are never to be undertaken in secret. 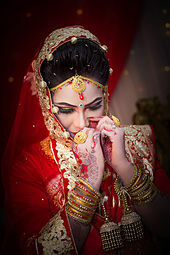 For many Muslims, it is the ceremony that counts as the actual wedding alongside a confirmation of that wedding in a registry office according to fiqh, in Islam a wedding is also viewed as a legal contract particularly in Islamic jurisprudences. However, most Muslim cultures separate both the institutions of the mosque and marriage, no religious official is necessary, but very often an Imam presides and performs the ceremony, he may deliver a short sermon.